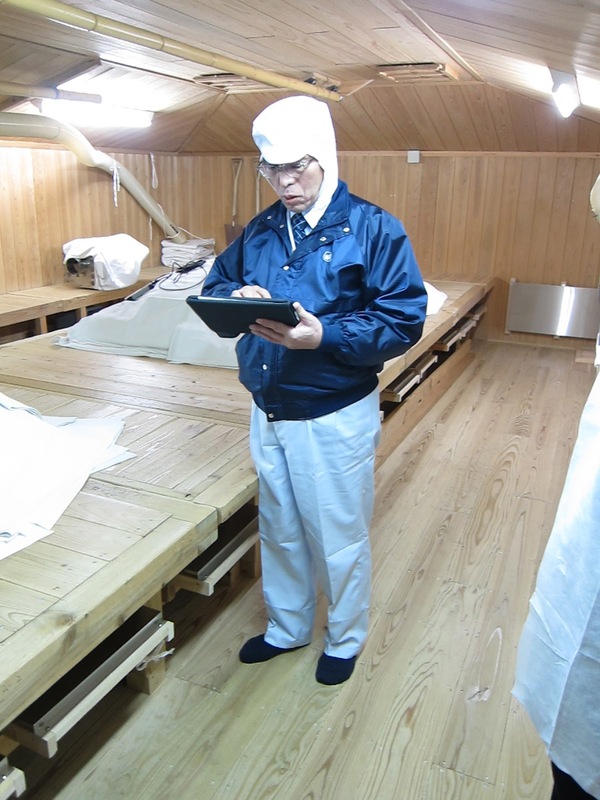 If you want to visit a Japanese sake brewery, be sure to wear attractive socks. You might be able to prevent a hanging. At every brewery I visited last week, I switched from shoes to slippers to stocking feet to slippers to other slippers. Part of this is culture: the Japanese obsession with the uncleanness of the bottoms of shoes, which are "soto" -- outside -- as opposed to "uchi," inside. But there's an extra layer of hygiene that you don't see at wineries, where I can wear holey, mismatched socks and nobody will ever know. Visitors to a sake brewery must wear lab coats and hair nets and wash our hands first with soap and then with alcohol. I thought the precautions were extreme until I asked about the consequences of not following them. A key difference between sake and wine or spirits is that a sake brewery is essentially a large petri dish with some key stages where no alcohol is produced. As much as you might worry about unwanted microorganisms getting into wine grapes, they will start fermenting right away, creating alcohol and CO2 that will increasingly protect them. Sake requires a specific mold, koji, to convert rice starch into sugar, and when the rice is undergoing this process, it is extremely vulnerable to microorganisms. You can't sterilize the rice, as many large wineries do to grapes by blasting them with sulfites, because then the koji won't grow. You have to provide an extremely clean, hygienic, warm and humid environment for your beds of freshly steamed rice. In other words, you have to serve up a dish of rice that microbes just love to eat, and then make sure only one microbe eats it. "If bad bacteria gets into the koji rice, the bad bacteria will grow first and that will stay," says Isao Aramaki, production manager at Kamotsuru brewery, which has been making sake since the 1600s. "Then the koji rice will become really acidic. You have to throw it away, and you have to sterilize the room." But it's worse than that. You don't just lose one batch of sake: You have to shut down that part of the brewery for an entire month to make sure the infection is under control. Imagine shutting down a winery for a month in the middle of harvest season. You might have to forget about most, if not all, of that year's production. A brewery could find its existence threatened by such an infection. Since Japan has dropped from 2000 sake breweries to 1300 in just 20 years, this is not an idle threat. And since rural breweries are often a town's major employer, that could mean most of the village is suddenly out of work. "In the past, if there was an infection, the toji (master brewer) might hang himself," Aramaki said. "Or maybe seppuku," which is the more traditional term for hara-kiri, the dramatic suicide where one tries to regain honor by slicing (kiri) open one's stomach (hara) and contemplating one's intestines. I said, "Seppuku? Really?" He laughed. "No, hanging is probably good enough. That's what has happened in the past." I'm relieved, as hara-kiri really doesn't sound hygienic. Hence the lab coats and alcohol sprays and multiple changes of slippers. This is for visitors. Employees keep their work clothes at the brewery, changing at the beginning and end of each day. The enormous washing machines in large breweries would fit in fine at commercial laundromats. Visiting a brewery feels like touring an outdoor sauna in northern Finland. Winter is prime brewing season specifically because it's cold. Rice will keep all year; you can brew any time. But chilly weather inhibits microorganisms in the air, which is why the most famous traditional sake regions in Japan are all really cold, and breweries are unheated. I wore four layers under my lab coat at breweries in Niigata and still I shivered. But when I visited the koji room, warm and moist, beads of sweat formed quickly. Workers in that room wear t-shirts, loose pants, and headbands, usually all white, the better to see any contaminants. At Dassai brewery in Yamaguchi prefecture, they let me don the gear and work the koji rice. I washed and sterilized my hands, and then a brewery employee took hold of my hands and washed them again. And still the employees looked on disapprovingly at the young vice-president who allowed me and four master sommeliers from the US to put our hands in the rice. "Your father wouldn't approve," I could imagine their frowns saying, but 4th generation owner Kazuhiro Sakurai is in his 20s, sings Green Day at karaoke, and is so proud that Jessica Simpson got embarassingly shitfaced on his sake in LA that he has a paparazzi article about it posted on the wall of the brewery store for everyone to see. I worked for about 10 minutes. The rice, polished to 50% of its original size, had been steamed, cooled to about 90 degrees Farenheit, and was laid out on long tables. Our task was to break up any clumps in it so the koji could evenly penetrate. We built mounds in the middle of the table, ran our fingers through it, then spread it back out again. A worker cautioned me not to use both hands to avoid splitting open the rice, which could cause those grains to grow mold more quickly than the others. Then I was handed a shaker, like those used for Parmesan cheese, full of the precious koji mold, and allowed to make two passes at shaking the mold down on the rice. The real workers had a perfect rhythm -- a point/counterpoint, with one leader shaking and the others following -- and they never spoke. I was herky jerky, not high enough, poor elbow form. The frowns. I tried my best. Then we all had to squat on our haunches, below the level of the tables, without speaking, without breathing hard, and most definitely without sneezing, while the precious spores in the air wafted down onto the rice. The fans normally used for heating and cooling were turned off, the better to still the air. I could hear my heart beating. After about 5 minutes the workers rose and pointed to the door. They couldn't wait to get us out of their koji room. Outside, we put our slippers back on and headed to safer parts of the brewery. Hours later, while drinking Dassai 23 and eating blowfish (there's another story), I began to feel a creeping unease that fortunately didn't feel like numbness or intestinal distress. What if I brought rogue bacteria from America? Or more locally? I had natto (fermented soybeans) with breakfast, and that is banned from breweries because of its own microbial content. What if I exhaled a hint of its essence? What if the Dassai 50 sake, this year, is spoiled because of me? Would I have to commit hari-kiri? As my knife work is as clumsy as my mold distribution, hopefully hanging will be sufficient. Great article, Blake. I am a gaijin from Oregon working as a kurabito in Kyushu this season. You effectively told the story like you've worked 31 of the last 32 days in a row, like me. Sake yeast works harder in the cold, too, releasing more enzymes in the winter weather versus summer. Please continue to write about sake! Is there radiation in Japanese sake?